Almost as unthinkable as the wedding, however, is that in order for Mario to stop the wedding, he has to visit some places that look suspiciously like the real world. 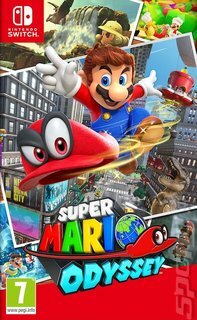 Yep, Super Mario Odyssey is certainly true to its title - as Mario you'll journey far and wide, across not-quite-real world locations and more familiar spots that more closely resemble the Mushroom Kingdom. It's a game in the tradition of titles such as Super Mario 3D World, with environmental exploration right at the heart of play. In each area (which you'll travel to using Mario's top hat-shaped starship!) you'll have story missions to complete and bosses (hailing from Bowser's wedding planning firm!) to beat, but also a series of Power Moons to collect in order to power your ship. You might get these by simply hunting around and solving environmental puzzles, or you might need to solve some side quests to get the job done. Either way, you'll encounter some classically creative level design along the way. As well as a change in format, there's a significant change to the way you play in the form of Cappy. A sentient hat, Cappy can be used for moves such as being thrown at enemies or serving as a temporary mid-air platform for Mario. More interestingly, however, you can use him to CAPture a range of enemies and objects and possess them. You might find yourself piloting Bullet Bill, throwing weapons as one of the Hammer Bros or swimming underwater as a Cheep Cheep fish. The possibilities are endless. To put it all in a nutshell, Super Mario Odyssey is to Mario what Breath of the Wild is to Zelda.